In many ways, the Lost Doctor seems like the very antithesis of his predecessor. Vivacious, gregarious, and quick to smile, he seems to find friends with all manner of species in every corner of space and time, whilst his boundless curiosity leads him into yet more trouble than ever before. Even his choice of outfit—a cream or white linen suit, and a Panama hat he takes everywhere—highlights the contrast between light and darkness in terms of his character. If his new persona feels in some ways like the regeneration process repelling against the status quo, then one particular aspect of his physicality is a direct consequence of the events that led to his arrival. The Nth Doctor just barely regenerated, having exposed himself to a deadly dose of radiation during a climactic effort to save the galaxy from destruction, leaving the Lost Doctor with a severe allergy that has already manifested itself as a potentially lethal hindrance in moments of high drama. Added to this, the violent regeneration process has left him bereft of a full understanding of his own origins. Gallifrey is a name he knows, but exactly where it is or why he fled his once home is knowledge that sits beyond his conscious memory. Make no mistake, though, this new man is still the Doctor. Lost he may be as he careers through time and space, unaware of his next destination, but underpinning this incarnation’s peculiarities are his enviable ingenuity, strong resolve, and sharp senses. He may hide behind a more humble and unassuming exterior than in his recent past, but this renegade Time Lord is still a formidable figure, and his reputation precedes him for good reason. This entry was posted on 19/09/2016 by hedgewick. 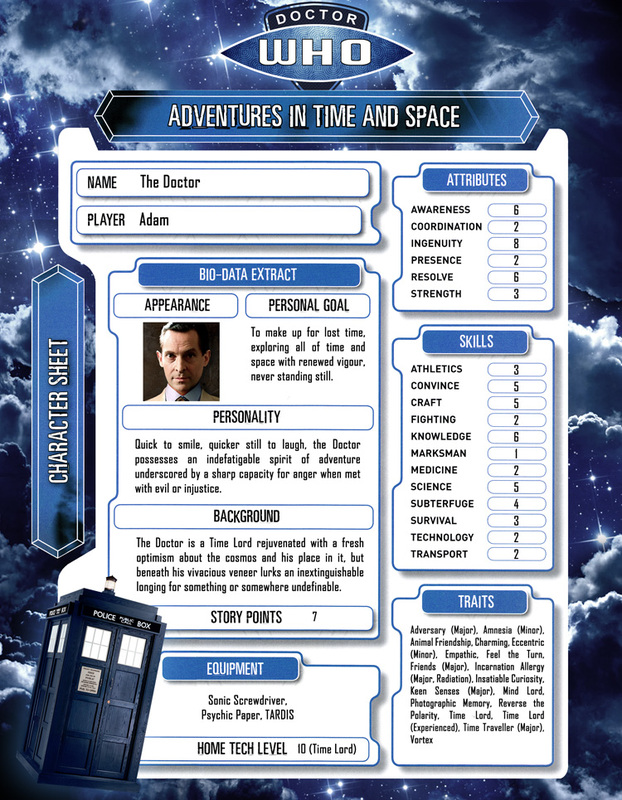 It was filed under The Lost Doctor and was tagged with Character Sheets.